Letterhead Printing - PrintFirm.com provides custom letterhead printing services online. It's FAST and EASY. Order today and SAVE! 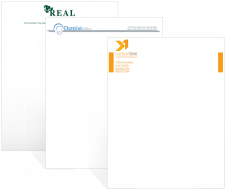 Your company’s letterhead is an important part of your paper product line. A letter might be kept for a long period of time and it can remind the customer of your business. Good-looking letterheads tell your customers that you are a professional company who cares about the small things. It can be the small things—either errors or customer perks—that separates your company from the competition. If you give customers the impression that you care about the small things, they may improve the quality of their communication with you. Lack of good communication between a business and its customers is a major reason that customers leave. Your business can control communication on your end, but it can’t control what customers choose to say. However, you can foster a good relationship with your customers with wise decisions about how your company is portrayed. Consistent, quality letterhead printing from PrintFirm ensures that your business is portrayed in a positive manner when sending letters. 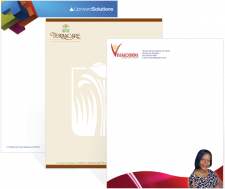 We carry one and two color letterheads and full color letterheads. All our letterheads are printed on quality 70 lb. paper. Our one and two color letterheads are available in the 8.5” X 11” paper format. For the first color, you have 10 color choices with letterhead printing. The second color gives you 9 choices. There is no bleed available for this product and therefore no solid backgrounds allowed. Our full color letterhead size options include 8.5” X 11 and 8.5” X 14”. Full bleed and a solid background option are standard for full color letterheads at no additional charge. You can upload your own letterhead design to our website. We accept all the popular graphic design file formats such as PDF, AI, and TIFF. For full color letterhead printing, we also have pre-made design templates that give you a basic graphics background. This will save you time during the design process. You can still add your own text and images to the templates. If nobody in your organization has graphic design skill, you can select the “custom design” option on our website. Our team of talented in-house graphic artists will create a unique design for you. Just as with the pre-made templates, you have the option of uploading proprietary graphics and text. In this case, you would upload them to our graphic artists and they will incorporate them into the design.